Mayo County, Ireland Horse Directory - O Horse! 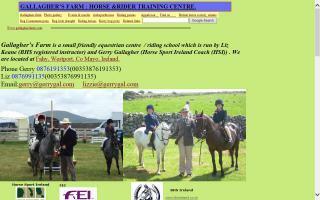 Horse riding and trekking for all abilities in beautiful Clew Bay, County Mayo, Ireland. Gallagher's Farm is a small, friendly equestrian centre / riding school which is run by Liz Keane (BHS registered instructor) and Gerry Gallagher (Horse Sport Ireland Coach (HSI)). We specialise in giving good quality lessons that cater to all levels, from absolute beginners to competition riders. Adult riders are especially welcome. Lessons can be arranged for any time: weekends, weekdays, or evenings. Lessons in dressage and show jumping, etc. Our horses are friendly and experienced. Clients can bring their own horse/pony. We also travel to clients for freelance coaching sessions at the rider's own home. County Mayo at a walking pace in a horsedrawn caravan! Holiday in Mayo in a horse-drawn caravan and see the real Mayo. Go trekking! Great horse riding vacations in Ireland. Wild riding experiences galloping the Atlantic coastline and stunning mountain trail rides on the Irish turf bog lands.